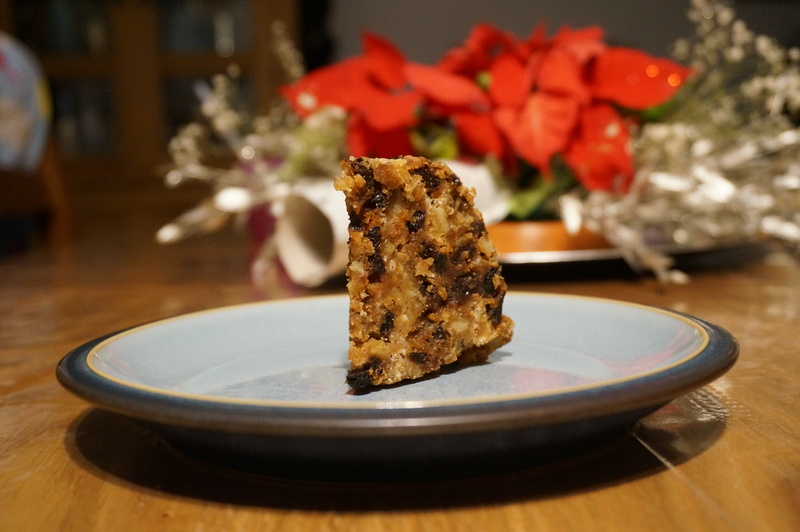 Another make-in-advance recipe, I made two small Christmas puddings at the end of October ready for Christmas. Christmas puddings aren’t difficult – but they do take a while to cook, because you have to steam them for so long (about 2 hours each for the size puddings I made). The actual mixing, however, is pretty simple. You just put it all together in a bowl, stir it up and then add a greaseproof paper and tin foil lid before steaming the pudding. The only (slightly) time-consuming tasks are creating the breadcrumbs and zesting the lemon. And adding all the ingredients together of course, because in total there are 14 or 15 of them. Once I had steamed the puddings, they just sat in bowls waiting for Christmas Day. On Christmas Day itself, there were two options – steam the pudding for a further 30 mins or so to reheat it, or stick it in the microwave for about 3 minutes. I went with the second, super-easy, option. It tasted fine – and adding a slug of brandy and setting light to the pudding just added to the Christmassy feel! Adding incredibly boozy brandy butter helped a lot too (although there was also clotted cream on offer for those who didn’t want the brandy butter). 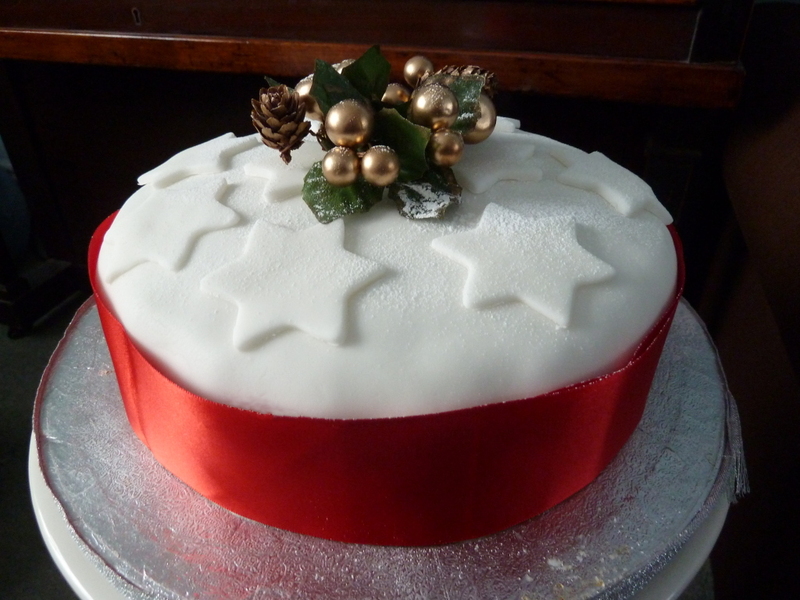 A “Fruit and nut” variation on the standard fairy cake, when coated in royal icing and decorated accordingly these cakes have all the good bits of Christmas Cake with the best of fairy cakes. Not as heavy or stodgy as their bigger, jolly cousin, they are still more substantial than an ordinary fairy cake and keep a lot better. 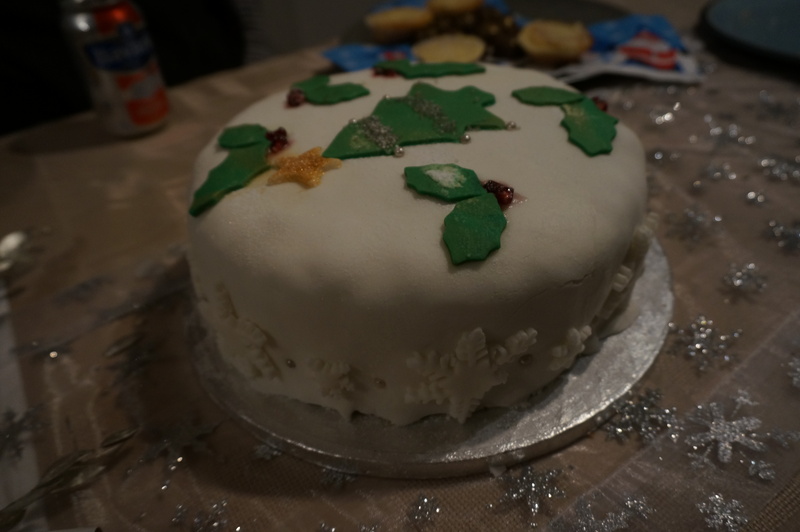 Left: Icing sugar inverse holly leaf. 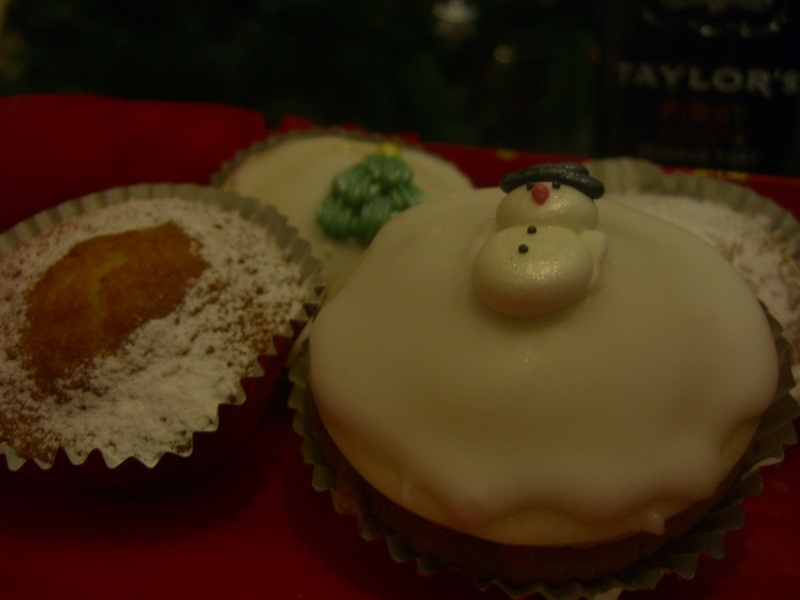 Top and Right: Mini Christmas Cakes coated with marzipan, royal icing and sugar decorations. These were boxed up attractively and given as a Christmas gift to a family member (Hi Tony! 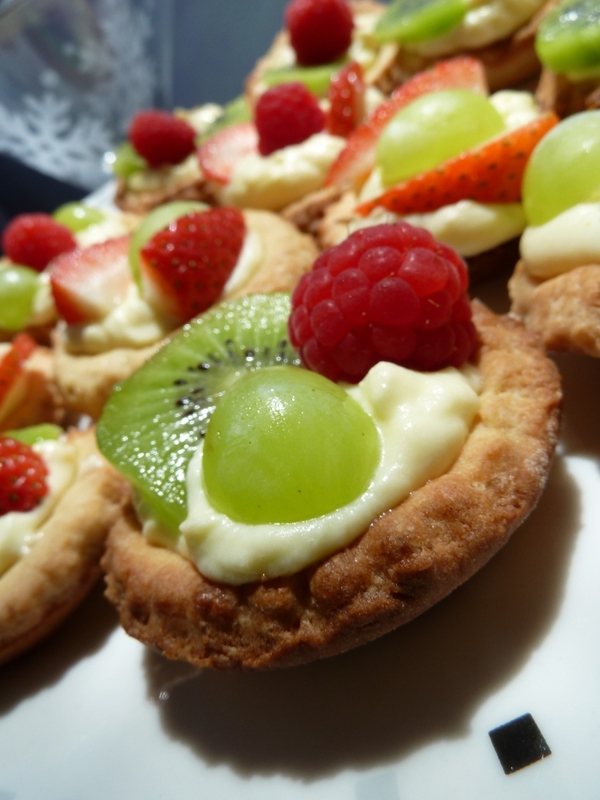 ), along with some standard fairy cakes in a variety of decoration schemes. I can’t speak for his opinion, but we’ve made these before and they are really tasty. The nuts help create a more complex flavour, but it is important not put in too many bitter varieties to keep the taste sweet. These obviously belong in with the December posts but these were delayed due to bad weather… there was the wrong type of snow on the internet wires or something. Oh yes – I was worried the snowmen in the field would come and get me if they saw their poor doomed friend above. Who made it: Anna made the cake, and insists Dan helped by cleaning up the leftovers. That is not true, of course, but I better not tell her that.. Recipe: “Fairy Cakes”, by Joanna Farrow, page 30.